The novelist and children's book author turns to nonfiction in an inventive new book about truth and reconciliation for young readers. Monique Gray Smith is a writer of Cree, Lakota and Scottish descent. In her loosely autobiographical novel Tilly, she explores the experience of a woman discovering aspects of her Indigenous ancestry in young adulthood. 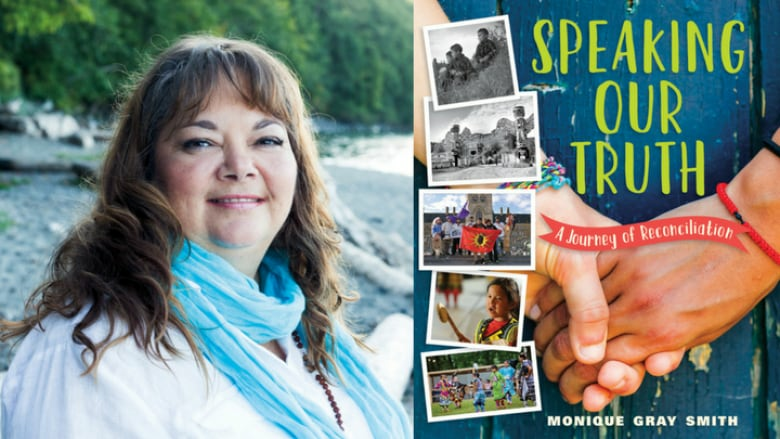 Her young adult nonfiction book, Speaking Our Truth, was a finalist for the $50K 2018 TD Canadian Children's Literature Award. Speaking Our Truth is a young person's companion to understanding the history and future of Indigenous-settler relations in Canada. Inspired by the work of Canada's Truth and Reconciliation Commission, Smith sets out to share the stories of survivors in a way that's accessible to young readers — an undertaking she says she was sometimes tempted to walk away from. In her own words, Smith talks about how she found the strength to continue writing Speaking Our Truth, and the response the book has received from readers young and old. "I knew at that point that I needed a metaphor that I could use as a guide and a foundation. I chose the metaphor of a braid of sweet grass. Each of the last three chapters in the book became one of the strands of the braid of sweet grass. They really were my guidepost that allowed me to say, 'How can I keep writing this book even on the days when I feel like I can't go on?'" "While I was writing, I thought a lot about when I was in school and what interested me. It was the social and emotional visiting that happened in classrooms. Not the intellectual pieces. In the end, what happened was I leaned intellectually, but I learned because my heart was engaged. My philosophy was to always ask, 'How do I ensure this book educates the hearts and minds of those who are reading it?' I have 14-year-old twins who, at the time of writing, were almost 13. I remember I gave my son the history chapter early on. He read one page and said, 'It's too much like a textbook.' I said, 'Okay, I'm back to the drawing board.'" "I put a post up on Facebook and I said, 'Are there any folks out there who have young people in their lives who might want to talk to me about Truth and Reconciliation?' I thought maybe I'd get eight responses, but I was inundated. Absolutely inundated. And for me that was so hopeful. I pulled names from a hat and interviewed a bunch of kids. I would go back to those interviews and those visits on the days when it was really hard to write. Especially the young person who told me, 'Awareness creates healing.' Their wisdom is so profound. "The interviews with survivors weren't as gentle, of course. I don't have a word that captures how it felt to be a witness to those stories — then to attempt to capture them in a way that held up the dignity of the stories without traumatizing a young reader. That was the dance throughout this whole book. Sometimes people need a gentle way in before they can read or hear other stories that might be more intense. This is the first time in a children's book that we've talked about the electroconvulsive chairs that were used on Indigenous peoples and the malnutrition in residential schools. We have to be careful — with the little ones especially. They don't need to know that whole history, but they do need to know the importance of being loving, of being kind, of being respectful. Those are the teachings that will help our country heal and move forward in a good way."